Recent release “Wizard’s Last Rule” from Page Publishing author Kathryn May Howard Whitaker is a spellbinding narrative of an evil witch’s desire to rule over a magical forest, and how the heroes in the book struggle to stop the impending reign of sorrow. Kathryn May Howard Whitaker, who is a talented painter and sculptor and has contributed beautiful artworks of watercolor, oil, pastels, and pen and ink, with her creations found in many gift shops and galleries in Plymouth, Massachusetts, has completed her new book “Wizard’s Last Rule”: an enthralling adventure as Trell, Mac Flin, Onton, and others join efforts to thwart a looming disastrous moment, and keep the magical forest of Elderwood safe and peaceful. 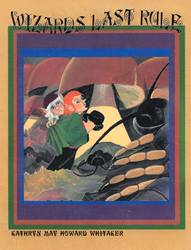 Published by New York City-based Page Publishing, Kathryn May Howard Whitaker’s tantalizing account follows the odyssey of a leprechaun and his companions, where every moment of struggle they face shows the importance of friendship in overcoming overwhelming circumstances. Readers who wish to experience this epic work can purchase “Wizard’s Last Rule” at bookstores everywhere, or online at the Apple iTunes store, Amazon, Google Play, Kobo, or Barnes and Noble.